Our U.S. Air Force Service Dress Jacket incorporates numerous improvements over the standard issue Jacket. 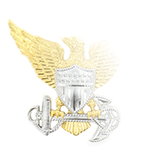 When the government contracting unit for military clothing, DSCP, issues its contracts on this garment, they set minimum requirements for how it is manufactured. These requirements are bare minimums that were created to make sure the jackets at least meet a "good enough" standard while keeping the price the government pays as low as possible. They then "issue" this garment for free to new Airmen that enlist (as part of the standard issue bag). Additional quantities are usually made available through AAFES store, though supplies are not always steady. Here, at The Salute Industries, we go beyond that. 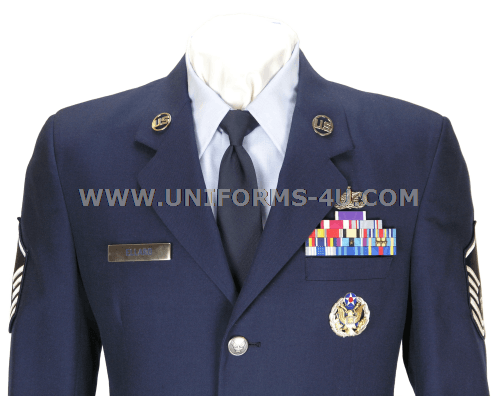 While we have to keep the final look and measurements of the Jacket to the exact military specs as specified by the Air Force, we go the extra mile to make the USAF Dress Uniform more durable, comfortable, and of a higher quality, mainly through feedback we received from our thousands of customers. 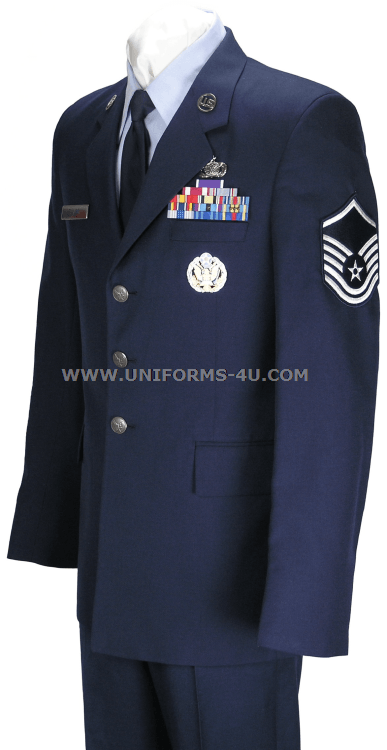 The Air Force Class A Jacket features a welted flap on the left chest, two welted flaps pockets on the lower front. Two additional inside welt pockets are included. On all dress Jackets, including this one, we use the highest possible quality of Sleeve Heads and shoulder pads. We also include canvas sleeve heads, to give the Jacket sleeves a nice look and feel. 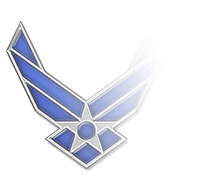 Based off direct feedback, airmen complained that the inside breast pockets frails, as those are the only actual pockets in the Jacket, they are frequently used to host wallets, documents, and sometimes phones. Our Master Tailor responded by fusing the lining pieces used in the inside pockets. This change give the inside pocket a much higher durability since the lining has a better body support to hold longer against wear and tear. While standing at attention, the standard chest pieces just hold the top of the Jacket. we upgraded both the quality and size of the Chest Pieces to cover the full front. Canvas is an extremely expensive material, but the benefits are worth the upgrade! In addition, we sandwich a hard type of canvas between a softer one on one side, and soft felt on the other. This prevents the hard canvas from damaging the Jacket, while at the same time pushing to jacket to adopt a perfect straight shape. Single breasted with three buttons and will have one welt pocket on the upper left side and two lower pocket flaps. 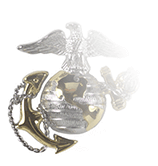 Manufactured to the military specifications. 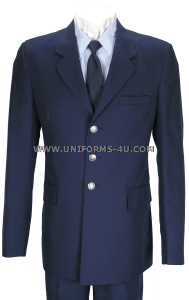 We are certified by the Air Force to manufacture the officer version of this coat. 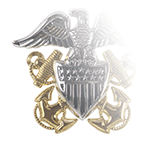 The Enlisted version lacks the epaulets since Enlisted personnel would wear the chevrons instead of the coat shoulder ranks officers use. 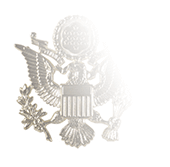 Per the stringent Military Specifications we follow to manufacture our uniforms, military dress Jackets are designed with longer sleeves than most customers would need. This is to accomodate various sleeve lenghts. 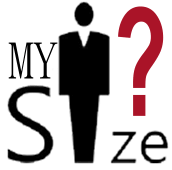 Virtually all customers would need to alter the Jacket sleeves. 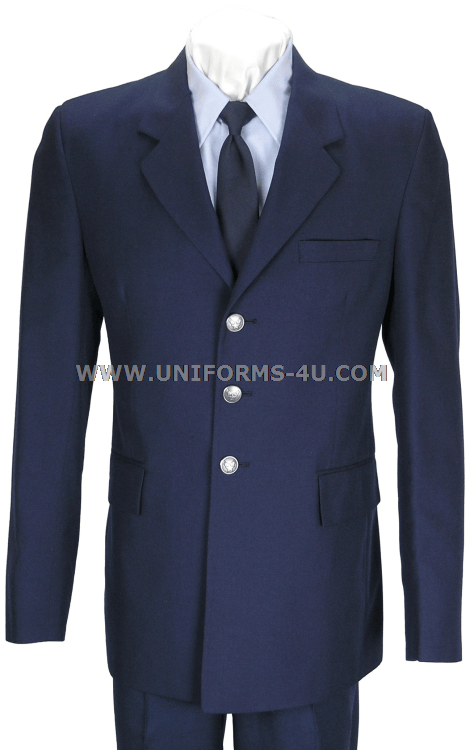 As such, to reduce your alteration costs, this dress Jackets ships with unfinished sleeves. We do offer sleeve alteration services that will be suggested to you as soon as you add the Jacket to your shopping cart, should you prefer to have us do the alteration for you and ship the Jacket ready to wear.